Rave & Raise was set up by students 1 year ago, and In the Last year they have raised over £1k for Roundabout, a Sheffield based charity that help the youth homeless get back on their feet! At our last event we had Drum and Bass legend Heist down to help in our mission!! ...And this time were teaming up with Mensai!!!! 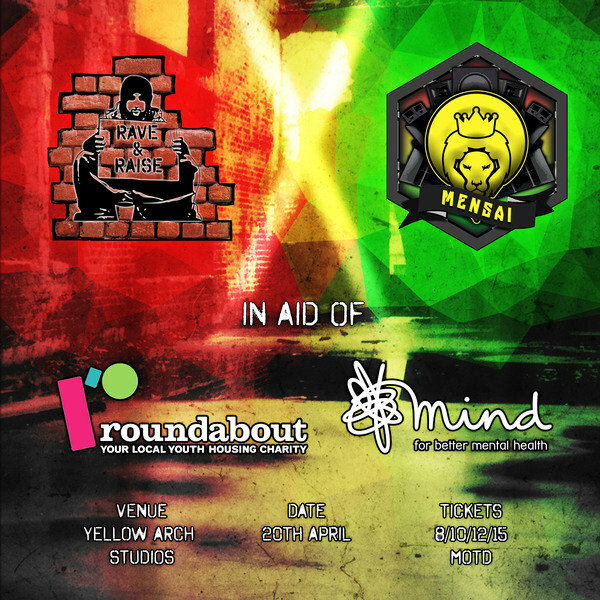 ..Coming from Manchester, Mensai Manchester, have gained their reputation by hosting 3 fundraising events in aid of Mind. They held a massive event in June last year raising over £2k for charities in aid of mental health awareness! Yellow Arch Studios are allowing us to use their space to bring you guys a FAT line up across 2 rooms.